The simmering Federation-Cardissian tensions come to a boil in “Chain of Command.” Edward Jellico replaces Jean-Luc Picard as captain of the Enterprise and everyone feels the stress from a rocky leadership transition. In this case, leaders can learn what not to do by noting the consequences of poor choices made by Starfleet and its officers. A conflict between Captain Jellico and Commander William Riker distracts from the key objectives, endangering millions of lives. As the episode navigates towards the climax, Jellico needs an expert shuttle pilot for a dangerous mission. He speaks with every shuttle pilot onboard and the consensus is that Riker is the best pilot by far. Knowing that it’s important to delegate this critical responsibility to the best person, irrespective of personality, Jellico approaches the off-duty first officer in his quarters. They “drop the ranks” and clear the air by sharing each other’s honest opinions. In this case, Radical Honesty crosses the line from professional and personal. While there is some merit to each critique, the scene is tinged with so much animosity that the scene proves more cathartic than constructive. Jellico was micro-managing every situation and his choice to contest every minor grievance did undermine his authority in the big picture. Riker had been stubborn instead of supportive and it interfered with the Cardassian negotiations. Honesty in the workplace should be based on a person’s actions, not their character. The two reach some sort of truce and the mission succeeds but they cannot repair their relationship. Both are fortunate that they conflict did not cause long-term damage to their Starfleet careers. The situation became so emotional that each person would not listen to reason and missed critical information. At any time, the two could have taken a step back to monitor how the mission was progressing. In order to create the second half of the two-part episode, where actors Patrick Stewart and David Warner can interact and debate the moral relativity of culture, the writers must fabricate a tenuous sequence of contrivances and McGuffins. Really, Captain Picard is the only Starfleet officer with sufficient knowledge of Krieger waves to lead this mission? Or that Doctor Crusher was the only one who could analyze the suspected metagenic weapons evidence? They couldn’t have briefed a team from the Military Assault Command Operations who could better attempt the mission? And on a Galaxy-class star ship with a crew complement of 1,014, the First Officer is the best shuttle pilot and the only one who can attempt the climatic shuttle flight? They couldn’t devote one of the thousand-plus places on the crew manifest to an extraordinary pilot who could save the day? Captain Janeway arranged for the temporary release of Tom Paris from the stockade so he could flew her ship but nobody thought to assign a comparable expert to the Federation flagship? If Starfleet invested in professional development, there would be many officers who could have stepped forward without endangering the most famous captain in the fleet. Jellico would not have been required to ask Riker to fly the ship, as he would have his choice of aces to pilot the shuttle. A good coach allows those who play on their teams to expand their skill sets and pushes them to the next level; everyone benefits when someone develops and contributes their expertise. 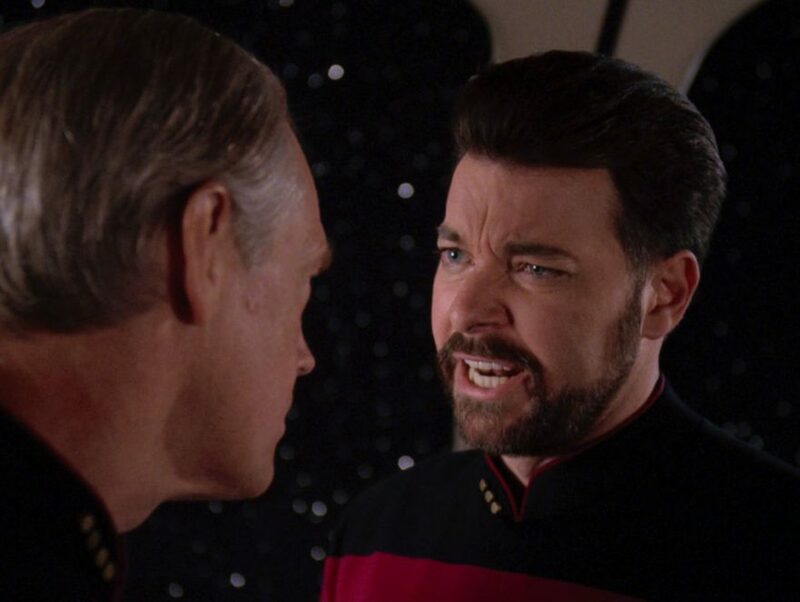 A source of tension between Riker and Jellico is moving from a three-shift rotation to a four-shift arrangement. Apparently the department heads need more time. Riker may have trouble organizing a thousand crewmembers but Lieutenant Commander Data would not. Certainly, someone would have to work a double-shift or two and they woulnd’t have been happy about it but the task could have been easily achieved to the new captain’s satisfaction. When first informed of Picard’s capture, it was clear that Starfleet was not going to order a rescue mission. However, someone could have begun planning one. If Riker was occupied with the negotiations with the Cardassians, he could have asked members of the security team to begin contingency planning. It certainly should not have been a choice between “Riker does it” or “nobody does.” Teams have more than one member so that a single person does not have bear all responsibility themselves. On multiple occasions in different Star Trek series, the Cardassians are portrayed as treacherous and conniving. In a previous episode, “The Wounded”, Picard remains suspicious of the Cardassians, assuring them that that Starfleet will be watching them. Yet in this episode, Starfleet Command falls for a clearly transparent ruse designed to kill or capture the most prominent captain in the fleet. If someone had been sceptical of the intelligence that they were receiving or had their hair-brained scheme been red-teamed, they would not have proceeded so rashly. If it seems too good to be true, it probably is.